Raleigh, NC – June 16, 2009 – (RealEstateRama) – Governor Bev Perdue and the N.C. Office of the Commissioner of Banks (“NCCOB”) today announced that the State Home Foreclosure Prevention Project (“NC Foreclosure Project”) has helped more than 1,000 North Carolina homeowners avoid foreclosure since the program’s inception in November 2008. 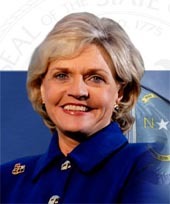 Last year, the General Assembly enacted the emergency program to reduce foreclosures on subprime loans and directed NCCOB to develop and implement the program (http://www.ncleg.net/EnactedLegislation/SessionLaws/HTML/2007-2008/SL2008-226.html). The program requires mortgage companies to file notices with the State in advance of foreclosure on subprime loans and authorizes the Commissioner of Banks to delay a foreclosure filing by 30 days, if the Commissioner believes a foreclosure can be prevented. Working with major mortgage companies, non-profit service providers, and state agencies, NCCOB developed a program to notify homeowners nearing foreclosure proceedings early and to make it easier for homeowners to access the existing network of over 150 certified housing counselors across the state. The NC Foreclosure Project also provides an opportunity for homeowners to have their subprime loans reviewed for potential violations of law by NCCOB-trained volunteers, who help NCCOB identify instances of suspected predatory lending and refer them to private or public enforcement. A network of legal service providers is available to assist homeowners referred by counseling agencies to provide further review of loans or foreclosure defense. In addition, NCCOB staff monitors the progress of loan work-outs to address communication breakdowns between housing counselors and mortgage companies. In the first seven months of operation, the program has prevented more than 1,000 foreclosures and connected over 3,000 homeowners to housing counseling agencies for foreclosure prevention counseling. The economic impact of the program to date is estimated at $86 million. • A Cumberland County homeowner was behind in his mortgage payments after having to make excessive medical payments due to his wife’s illness. Upon receiving the letter from NCCOB about the NC Foreclosure Project, the homeowner contacted a housing counselor for assistance. After assessing the homeowner’s situation, the counselor submitted a loan modification request to the servicer. The servicer was unresponsive and there were only days left before the foreclosure sale. NCCOB contacted the servicer who agreed to postpone the foreclosure sale and approved the homeowner for a loan modification. The interest rate was reduced from 11.25% to 5.00% resulting in a $256.00 monthly decrease in the payment. • A homeowner from Granville County had a 10-year pension that was ending in May 2009. Without the pension income, she knew she faced foreclosure on her home that she had owned since 1991. She reached out to NCCOB for assistance after difficulty communicating with her mortgage servicer. NCCOB contacted the servicer on her behalf and was able to negotiate her interest rate from 6% to 4.5% (fixed) and reduce her monthly payment by more than $250. The homeowner is extremely happy and says that without NCCOB assistance, she did not feel that she would have received assistance from the servicer. • A Mecklenburg County homeowner met with a counselor after receiving the NCCOB foreclosure prevention letter. She was falling behind on payments due to a reduction in income. She obtained steady employment and was able to keep the home with a lower payment. To further assist the homeowner on managing her budget, the counselor completed a financial budget and submitted a loan modification request to the servicer. The servicer agreed to modify the loan lowering the payment from 7.250% to a 3-year step rate modification: 3.250% for first 12 months, 4.250% for second 12 months, and 4.650% for the remaining life of the loan. • A Wake County homeowner purchased his home six years ago with an adjustable rate mortgage. Within a two year period, the rate increased in excess of 11%. This caused a severe financial hardship for the homeowner and ultimately caused him to be delinquent in monthly payments because his income was not enough to support the increased interest rate. The homeowner received a letter from NCCOB and contacted a partner counseling agency for assistance. The agency contacted the servicer and was able to negotiate a loan modification plan to lower the interest rate to 6%. The monthly payment was reduced from $996 to $677. • A Guilford County homeowner faced financial hardship due to a job layoff. He was three months behind on his mortgage and contacted the NC Foreclosure Project for assistance. The foreclosure counselor contacted the mortgage servicer on the homeowner’s behalf and was able to work out an affordable loan modification. The monthly payment was reduced by 5% and the interest rate was reduced to 5.75%. The homeowner has been able to maintain his payments and recently received a job offer. *Media: If you would like to set up a success story interview, please contact Ha Nguyen at the NC Office of the Commissioner of Banks, (919) 733-3016. • Housing counselors. Over 30 non-profit housing counseling agencies participate in this project. These agencies provide foreclosure prevention counseling at no-cost to the homeowner and assist homeowners in taking steps to get back on the right track. Housing counselors also work with the mortgage company to develop a loan work-out solution that is sustainable for the homeowner. NCCOB provided $600,000 to housing counseling agencies in 2008, and helped secure $2 million in other support for housing counseling agencies. • Connectinc. Connectinc., an award-winning non-profit in Rocky Mount, serves as the first point of contact for homeowners calling in response to NCCOB outreach efforts, connecting homeowners with the nearest housing counseling agency with capacity to serve their needs. Connectinc.’s participation is expanding to include follow-up with homeowners assisted by the project to track outcomes of the program and evaluate program success. • Mortgage servicers. Over 120 mortgage servicers have submitted pre-foreclosure notices to the database. Many servicers have dedicated loss mitigation staff to this project and have been essential to achieving positive results. • Legal network. A network of legal service providers, including Legal Aid of North Carolina, N.C. Justice Center, Legal Services of the Southern Piedmont, Pisgah Legal Services, the Financial Protection Law Center as well as volunteers from the N.C. Bar Association and law schools (UNC, Duke, NCCU, Charlotte School of Law and Campbell) have worked with NCCOB to offer legal assistance to homeowners involved in the NC Foreclosure Project. As of April 29, 2009, the volunteer attorneys, paralegals and law students have reviewed 402 subprime loans for potential legal violations. The providers in the legal services network have taken referrals from NCCOB’s partner counselors, when appropriate, to provide further assistance to homeowners trying to avoid foreclosures. • The Administrative Office of the Courts and the Clerks of Court in all 100 counties have worked with NCCOB to establish a system for assuring compliance with the requirements of the Emergency Foreclosure Reduction Act. • NCCOB is the lead agency in the NC Foreclosure Project, responsible for the development and implementation of the program. In FY2008-2009, NCCOB invested $1.5 million to support the NC Foreclosure Project. These funds were provided by the NCCOB’s receipts from operations (generally, assessments from firms regulated by the agency), not from tax revenues. NCCOB’s reports to the General Assembly on the NC Foreclosure Project can be found at: http://www.ncforeclosurehelp.org/Research.aspx. North Carolina’s foreclosure rate (number of loans in foreclosure process, seriously delinquent, or in foreclosure inventory) is the lowest in the South Atlantic region according to the most recent National Delinquency Survey results released by the Mortgage Bankers Association. North Carolina had the lowest rate of foreclosure starts as well as lowest rate of serious delinquencies. North Carolina has had a 9% decrease in foreclosure starts compared to this time last year, according to data from the Administrative Office of the Courts. More details about the emergency foreclosure prevention program can be found at: http://www.ncforeclosurehelp.org/StateForeclosurePreventionProject.aspx. NCCOB regulates state-chartered banks, thrifts, savings and loans, trust companies, and more than 900 mortgage lenders/servicers/brokers and 9,500 loan officers, as well as numerous consumer finance companies, check-cashers, and other financial services.